Adam and Eve debate the finer points of theology. By Rubens. Except they never did. No, the serpent never beguiled Eve, nor was Adam ashamed of his nakedness. Whatever next? I have decided to republish this post for a couple of reasons. It was very popular last time. So, my question is simply this: What are the people on? In a comment that will rock the confidence of many traditionalist or literalist Christians of all denominations, Australia’s Roman Catholic Cardinal George Pell – one of the most conservative Roman Catholics in a senior position worldwide, and a possible future Pope – has publicly described the biblical story of Adam and Eve as a sophisticated myth used to explain evil and suffering rather than a scientific truth. Cardinal Pell appeared on the Australian Broadcasting Corporation’s “Q&A” TV chat show, where he was debating British evolutionary biologist and celebrity atheist Richard Dawkins. Cardinal Pell said humans “probably” evolved from Neanderthals (this is not strictly true*, but at least it concedes that mankind has a long history) but it was impossible to say exactly when there was a first human. “But we have to say if there are humans, there must have been a first one,” he said. According to Genesis, God created Adam and Eve as the first man and woman. Asked by journalist Tony Jones if he believed in the existence of an actual Garden of Eden with an Adam and Eve, Cardinal Pell said it was not a matter of science but rather a beautiful mythological account. “It’s a very sophisticated mythology to try to explain the evil and the suffering in the world,” he said. The interesting issue is that when a senior Churchman concedes one story in the Bible is mythology – meaningful, but mythology, nevertheless – then we must ask, what else is? Noah and the Flood is one biblical story which is clearly ludicrous, unless you think he also collected two by two of every grub, bacteria and virus on the planet. Critical theologians have long demonstrated that some of the chronology of the Old Testament – especially concerning Moses and Joshua, is not literally true. Once you remove one brick from the wall, the edifice of the literal 100% truth of the Bible collapses – correctly, in my view – and we can start to apply a modern mind to the writings of the past. This, of course, is why so many Roman Catholics and evangelical Protestants are hysterical about not reducing the verisimilitude of the Bible by a single word. What, for example, of the argument that the Bible says nothing at all about homosexuality when it is read in the original languages, even Pauline comments in the New Testament which appear irrefutable. Will we next see Pell refute his implacable opposition to homosexual communicants and priests? 390 The account of the fall in Genesis 3 uses figurative language, but affirms a primeval event, a deed that took place at the beginning of the history of man. Revelation gives us the certainty of faith that the whole of human history is marked by the original fault freely committed by our first parents. 397 Man, tempted by the devil, let his trust in his Creator die in his heart and, abusing his freedom, disobeyed God’s command. This is what man’s first sin consisted of. All subsequent sin would be disobedience toward God and lack of trust in his goodness. 398 In that sin man preferred himself to God and by that very act scorned him. He chose himself over and against God, against the requirements of his creaturely status and therefore against his own good. Created in a state of holiness, man was destined to be fully “divinized” by God in glory. Seduced by the devil, he wanted to “be like God”, but “without God, before God, and not in accordance with God”. 399 Scripture portrays the tragic consequences of this first disobedience. Adam and Eve immediately lose the grace of original holiness. They become afraid of the God of whom they have conceived a distorted image – that of a God jealous of his prerogatives. 403 Following St. Paul, the Church has always taught that the overwhelming misery which oppresses men and their inclination towards evil and death cannot be understood apart from their connection with Adam’s sin and the fact that he has transmitted to us a sin with which we are all born afflicted, a sin which is the “death of the soul”. Because of this certainty of faith, the Church baptizes for the remission of sins even tiny infants who have not committed personal sin. To my mind this interpretation sheets home to some atheists as much obsession with literal interpretation as I criticise in some Christians. Indeed, sometimes when I see leading atheists and leading believers go at it hammer and tongs, they remind me more of each other than anything else. Anyhow: “Original Sin” – being a description of humanity’s essentially imperfect state – does not, in my opinion, need to be established by the literal truth of the Genesis story. I am quite content to assert that humanity is flawed, (just look around you), and that Christ was not (read the stories). When, how, and why humanity became flawed and why God chose the unique nature of Jesus to correct the matter can, for me, wait until I no longer see as through a glass darkly, which I do not expect to be anytime soon, and certainly not in this life. *While human evolution begins with the last common ancestor of all life, it generally refers to the evolutionary history of primates and in particular the genus Homo, including the emergence of Homo sapiens as a distinct species of hominids (“great apes”). The study of human evolution involves many scientific disciplines, including physical anthropology, primatology, archaeology, linguistics, embryology and genetics. Primate evolution likely began in the late Cretaceous, 85 Ma (million years ago) by genetic studies and no later than the Paleocene by the fossil record 55 Ma. The family Hominidae, or Great Apes, diverged from the Hylobatidae family 15-20 Ma. Around 14 Ma the Ponginae or orangutans diverged from the Hominidae family. Later the gorilla and chimpanzee would diverge from the lineage leading to the genus Homo, the latter around 5-6 Ma. Modern humans evolved from the last common ancestor of the Hominini and the species Australopithecines some 2.3-2.4 million years ago in Africa.In the Hominini tribe, several species and subspecies of Homo evolved and are now extinct or introgressed, and only one species remains. Examples include Homo erectus (which inhabited Asia, Africa, and Europe) and Neanderthals (either Homo neanderthalensis or Homo sapiens neanderthalensis) (which inhabited Europe and Asia). Archaic Homo sapiens, the forerunner of anatomically modern humans, evolved between 400,000 and 250,000 years ago. Examples of archaic humans generally include Homo heidelbergensis, Homo rhodesiensis, Homo neanderthalensis and sometimes Homo antecessor and Homo ergaster. 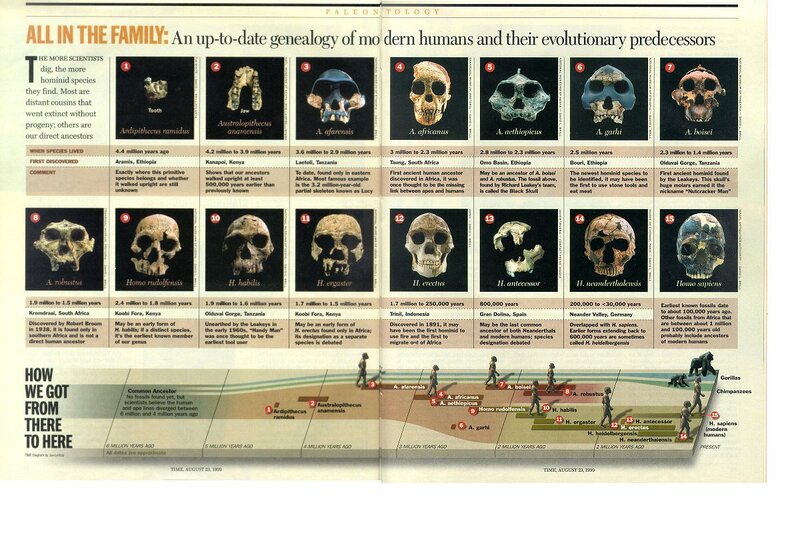 Anatomically modern humans evolved from archaic Homo sapiens in the Middle Paleolithic, about 200,000 years ago. Behaviorally modern humans developed around 50,000 years ago according to many although some view modern behavior as beginning with the emergence of anatomically modern humans. Time magazine has a go at explaining, er … time. Lots and lots of time. One view among scientists concerning the origin of anatomically modern humans is the recent African origin of modern humans hypothesis (the “recent single-origin hypothesis” or “recent out-of-Africa” model), which posits that Homo sapiens arose in Africa and migrated out of the continent some 50,000-100,000 years ago, replacing populations of Homo erectus in Asia and Neanderthals in Europe. An alternative multiregional hypothesis posits that Homo sapiens evolved as geographically separate but interbreeding populations stemming from the worldwide migration of Homo erectus out of Africa nearly 2.5 million years ago. Evidence suggests that several haplotypes of Neanderthal origin are present among all non-African populations, and Neanderthals and other hominids, such as Denisova hominin may have contributed up to 6% of their genome to present-day humans. In my native London, cockney rhyming slang ( apples and pairs, stairs…whistle and flute, suit etc) also had a term that goes, ironically… would you Adam an’ Eve it?…meaning “would you believe it?”- so the good Catholic has upset the Roman Catholic church, the Pope and a pretty tough bunch of East London Cockneys, not bad for a days work. I love rhyming slang – you just gave me an idea for a blog! Thank you! Great post! Thoroughly enjoyed reading it. The Catholic Church never ceases to amaze me. I could probably make a living just analyzing them and the different stances they take. Great post, I hope to hear more from you. An interesting organisation to say the least! Thanks for the feedback, much appreciated 🙂 Please drop by anytime. I have a feeling I will. 🙂 And please feel free to drop by my site as well. I would love to get some feedback from you. Thank you for letting me know about this. It was a great read. http://www.youtube.com/watch?v=mEwrkjTbWgU this is well worth a watch for enlightenment on the churches long standing stance on evolution and Genesis. Very helpful, I recall seeing the programme when it came out. I really do think “Creationism” is a terrible distraction for modern Christianity and not what it is all about – nor should it really be what atheism is all about. Thanks for dropping by and posting! Jesus was flawed too (read the stories!). Still doesn’t change the mythology or the messages trying to be promoted. Even if you had incontrovertible truth that Jesus was just a man like the rest of us and that most of the mythology and messages were added later, it wouldn’t detract from those messages. Love thy neighbour as thyself… works whatever you believe about the rest. Very true, my friend, very true! Thanks so muich for stopping by and commenting. I knew I liked you Yolly, and this article just confirms it – I (and a couple of my friends) agree totally! We are devout Christians – but ones who can think, are self deprecating, love others regardless of whether they share our views, and who have a sense of humour!!! We all abhor fundamentalists of any shape, size or description too. There is a book by (I believe) an Australian, Murray Watts, called Rolling in the Aisles, published I think in the 80s, probably available second hand, where he points out that Jesus had a sense of humour – look at what happened on the first Emmaus Walk – they didn’t recognise Jesus, and when they eventually did, he disappeared – perfect comic timing, said Watts. People could only believe the Old Testament to be literally true if they had never ever read it – it contradicts itself left, right and centre – most obviously on the subject of marriage where sometimes widows are married off to their deceased husband’s nearest male relative (eye wateringly close, very often), sometimes it is forbidden. (As for their views on slavery, and on children – yikes!). The New Testament has holes (look at Jesus’ geneology for one – it gives his father’s descent from the House of David…. now hang on….!) but I do prefer it to the Old. ((I love the cartoon ‘Dammit, my back hurts’ – but is it possible to alter the second to right image just a tiny, tiny bit – I think his behind has had a slight prolapse! )).